Please follow the guide below to clear your browser cache if you are not able to see our new website. Your browser's cache, pronounced like cash, is a collection of web pages, including the text, images, and most other media contained on them, that is stored on your hard drive or phone storage. Having a local copy of a web page makes for very quick loading on your next visit because your computer or device doesn't have to download from the internet all of that same information again. Cached data in the browser sounds great, so why do you ever have to clear it? Why Do You Have to Clear Cache? Clearing your cache forces your browser to retrieve the newest copy available from the website, something that should happen automatically but sometimes does not. You might also want to clear the cache if you're experiencing issues like 404 errors or 502 errors (among others), sometimes indications that your browser's cache is corrupted. Another reason to delete browser cache data is to free up space on your hard drive. Over time, the cache can grow to a really large size, and so clearing it out can recover some of that previously used space. Regardless of why you might want to do it, clearing your cache is really easy to do in all the popular browsers in use today. In Google Chrome, clearing the browser cache is done via the Clear browsing dataarea in Settings. From there, check Cached images and files (as well as anything else you want to remove) and then tap or click the CLEAR DATA button. 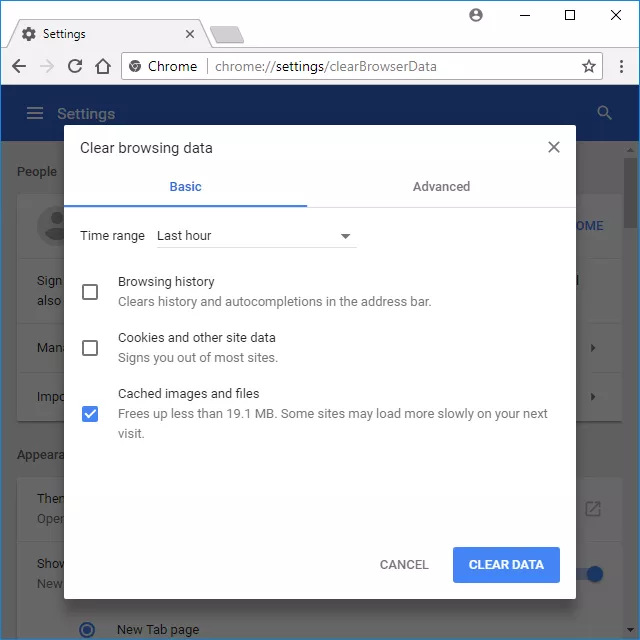 Tip: Choose All time from the Time range option at the top of the Clear browsing data window to make sure you get everything. In Chrome's mobile browser, go to Settings and then Privacy. From there, choose Clear Browsing Data. In this menu, check Cached Images and Files and press the Clear Browsing Data button once, and then again for confirmation. In Microsoft Internet Explorer, the browser that comes pre-installed on most Windows computers, clearing the cache is done from the Delete Browsing Historyarea. From here, check Temporary Internet files and website files and then click or tap Delete.Like with other popular browsers, the fastest way to the Delete Browsing History settings is via the Ctrl+Shift+Del keyboard shortcut. See How to Clear the Cache in Internet Explorer for a full set of instructions. Tip: Internet Explorer often refers to the browser cache as temporary internet filesbut they're one in the same. In Mozilla's Firefox browser, you clear the cache from the Clear Recent History area in the browser's Options. Once there, check Cache and then tap or click Clear Now. The Ctrl+Shift+Del keyboard shortcut is probably the fastest way to open this tool. 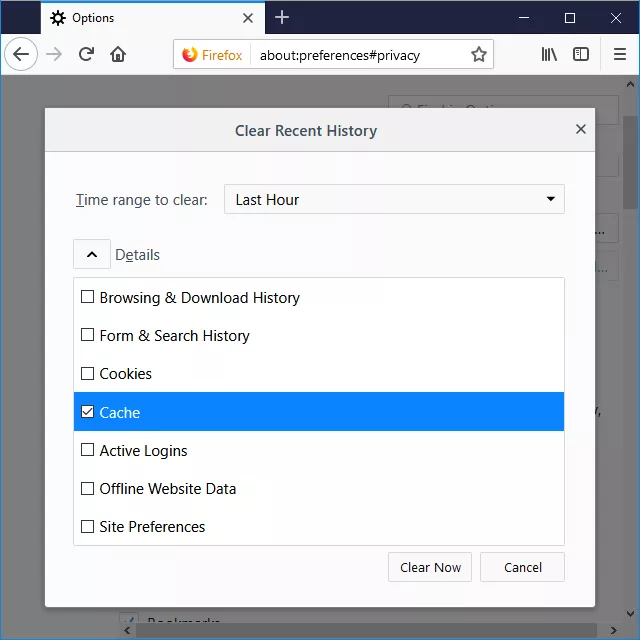 It's also available from Firefox's Menu button (the three-lined "hamburger" button) via Options, then Privacy & Security, and finally the clear your recent history link from the History area. See How to Clear the Cache in Firefox for a complete tutorial. Tip: Don't forget to choose Everything from the Time range to clear: set of options, assuming that's the time frame you want to clear the cache over. If you're using Firefox's mobile app, tap the menu from the bottom right and then choose Settings from that menu. Find the PRIVACY section and tap Clear Private Data. Make sure Cache is chosen and then tap Clear Private Data. Confirm with an OK.
Firefox Focus is another mobile browser from Firefox that you can clear the cache from using the ERASE button on the top right of the app. 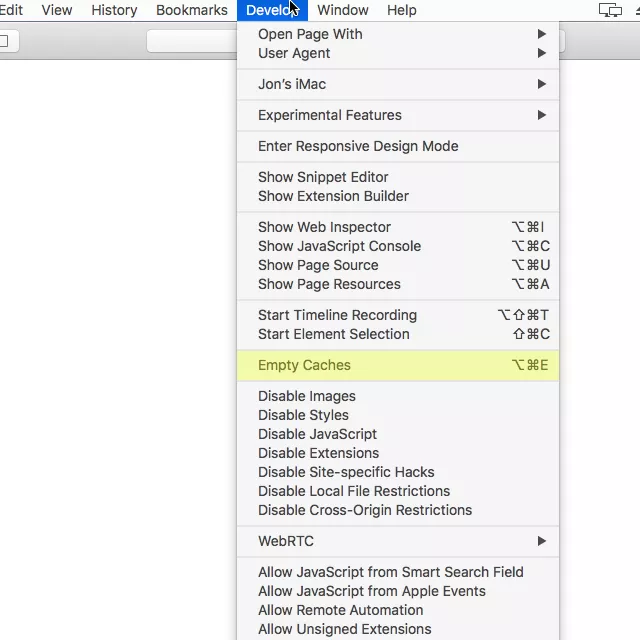 See How to Clear the Cache in Safari [help.apple.com] if you need more help. Tip: If you don't see Develop on your Safari menu bar, enable it via Safari >Preferences..., then Advanced, followed by selecting the Show Develop menu in menu bar option. Clearing the browser cache from mobile Safari, like the one on your iPad or iPhone, is accomplished in a different app. From your device, open the Settings app and then find the Safari section. In there, scroll toward the bottom and tap Clear History and Website Data. Tap Clear History and Data to confirm. Without a keyboard, click or tap the main menu button (the Opera logo from the upper-left hand side of the browser), then Settings, Privacy & security, and finally the Clear browsing data... button. Check the Cached images and files option and then press Clear browsing data. See How to Clear the Cache in Opera [help.opera.com] for detailed instructions. Tip: Be sure to choose the beginning of time option at the top so you're sure to erase everything! You can clear the cache from the mobile Opera browser, too. Tap the Opera icon from the bottom menu and then navigate to Settings > Clear... to choose what to delete: saved passwords, browsing history, cookies and data, or all of it. 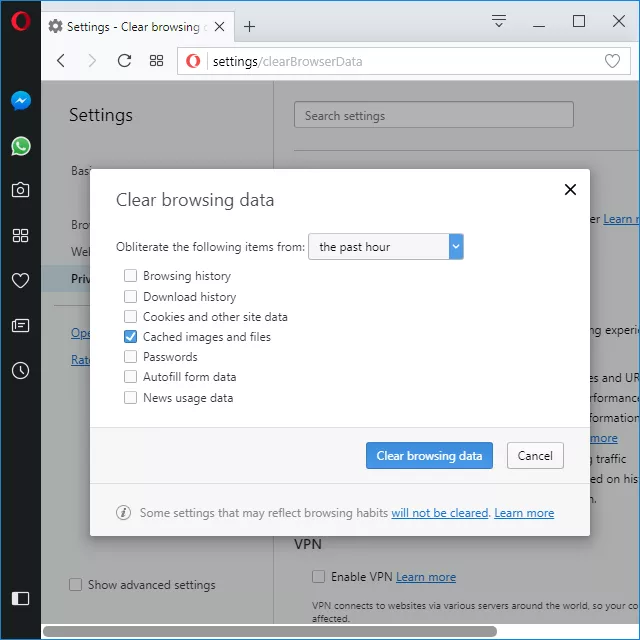 In Microsoft's Edge browser, included in Windows 10, clearing the cache is done via the Clear browsing data menu. Once open, check Cached data and files and then tap or click Clear. Another option is via the Settings and more button (that little icon with three horizontal dots), followed by Settings and then the Choose what to clear button under the Clear browsing data heading. 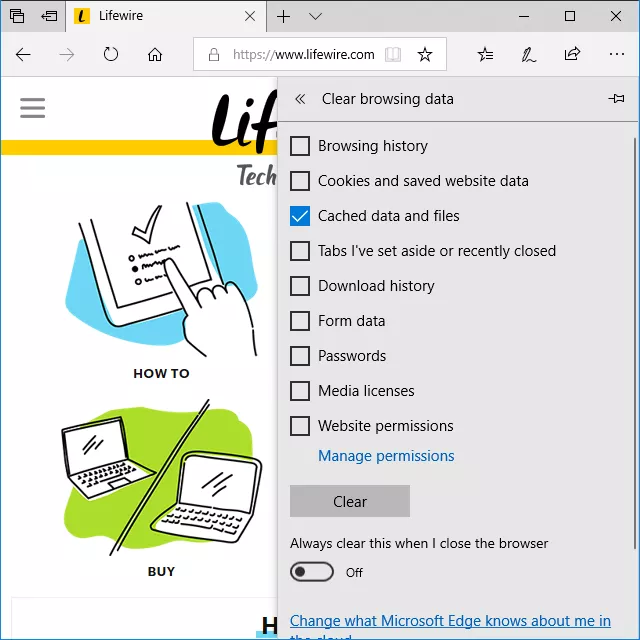 See How to Clear the Cache in Microsoft Edge [support.microsoft.com] for more extensive help. To delete cache files from the Edge mobile browser, go into the menu using button on the right side of the menu, and choose Settings. Go to Privacy > Clear browsing data and choose what you want removed; you can pick cache, passwords, form data, cookies, and more.